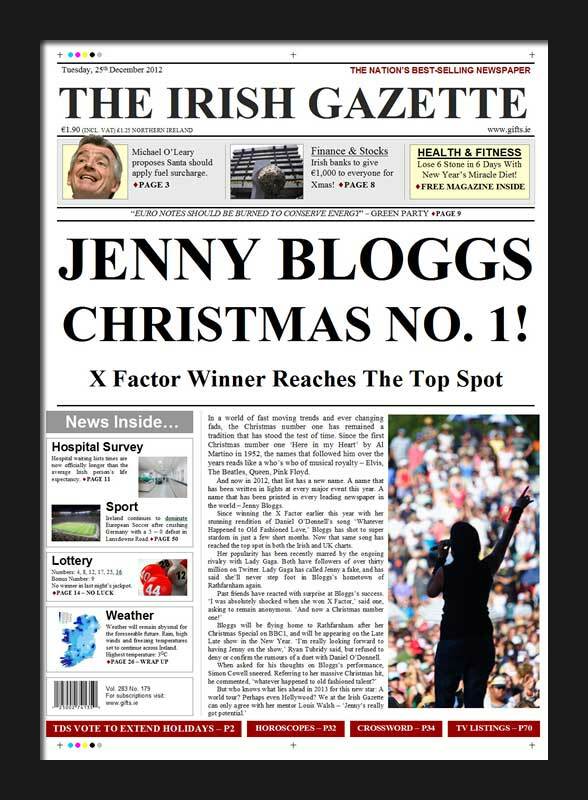 Headline: JENNY BLOGGS CHRISTMAS NO. 1! In a world of fast moving trends and ever changing fads, the Christmas number one has remained a tradition that has stood the test of time. Since the first Christmas number one ‘Here in my Heart’ by Al Martino in 1952, the names that followed him over the years reads like a who’s who of musical royalty – Elvis, The Beatles, Queen, Pink Floyd. And now in 2012, that list has a new name. A name that has been written in lights at every major event this year. A name that has been printed in every leading newspaper in the world – FIRSTNAME SURNAME. Since winning the X Factor earlier this year with her stunning rendition of Daniel O’Donnell’s song ‘Whatever Happened to Old Fashioned Love,’ SURNAME has shot to super stardom in just a few short months. Now that same song has reached the top spot in both the Irish and UK charts. Her popularity has been recently marred by the ongoing rivalry with Lady Gaga. Both have followers of over thirty million on Twitter. Lady Gaga has called FIRSTNAME a fake, and has said she’ll never step foot in SURNAME’s hometown of TOWN again. SURNAME will be flying home to TOWN after her Christmas Special on BBC1, and will be appearing on the Late Late show in the New Year. ‘I’m really looking forward to having FIRSTNAME on the show,’ Ryan Tubridy said, but refused to deny or confirm the rumours of a duet with Daniel O’Donnell.